Oisly is a quiet village located in the Sologne, roughly at mid distance between Cheverny and Saint Aignan (see the mairie-école on the left and the church with its maison de curé on the right). The Coop of Oisly, named Confrérie des Vignerons de Oisly & Thésée is one of the many French coopératives that stand out of the flock. Don't be put off by its outside appearance, the coop of Oisly (let's call it this way) has been doing a good work along the years and was home to several of the region's artisan vignerons like for example Joël Courtault and Michel Augé. It was created in 1961 from two estates only (one from Oisly, one from Thésée), and as a shared commercialization tool only at the very beginning. It morthed rapidly into a full-blown coop with winemaking facility and bottling line as well as distribution network, gathering 55 participating estates at its peak in the 1990s' (with a surface of 550 hectares). From the start, the coop sold wine in bottles, and this, to individual buyers, cafés and restaurants, with many clients in the Paris area too. Since then, the surface and number of vignerons dwindled to 250 hectares (vines being aged 25 years on average today) and 21 participating vignerons, for reasons like young heirs taking over their parents' estates after enology studies and deciding to bottle their wines and market them themselves. From the start, the Coop was very active on the Sauvignon production and on the sale in bottles, while in the early 1960s' most coops would still sell most of their wine in bulk. Nice vine (probably Sauvignon) outside Oisly The facility was built in several times, important addings being made in 1990 to house more vats (the pic with the press), then again in 1994 (the pic with the tall vats) because at the Oisly coop, they wanted to vinify in individual vats the different vineyards as much as possible, and the volumes go from 57 hectoliters to 190 hectoliters for the reds, the biggest vat for the Sauvignon making 300 hectoliters. The goal is also that each vigneron can see the result of his work till the finished wine. Then, blends are made, the best wines being set apart and bottled separately. There are 222 vats across the coop, which needs more work and lab checks. Very quickly in the early years, the coop was used as a prime partner by the ITV (a French State research body -- Institut Technique de la Vigne) in Tours (now the IFV). The people of the ITV were looking at the time for a chai where they could conduct real-size trials on vinification, especially for the selection of adequate fermentation yeasts. Agnès Bardet says that the concern at the time was the unfinished fermentations, and the malolactic fermentation wasn't very well understood then. So the ITV technicians they came here regularly to work and make experiments, bringing their analysis tools and helping the coop master their fermentations. This was somewhere in the early 1970s', and most of the experiments were centered on the Sauvignon, at least in the beginning. Before the, the coop would use indigenous yeasts like many vignerons at that time. The Sauvignon yeasts developped by the ITV research lab were selections taken from these very indigenous yeasts and found on the grapes in the close area. The 1970s' temperature-controlled vats At the same time, the importance of setting the right temperature for the fermentation was beginning to be grasped and the ITV helped the coop equip itself in 1971 with some of the first temperature-controlled fermentation vats. This was extremelly rare then in the mid 1970s' and the Oisly coop was maybe the first of its kind to get this sort of winery tool. These 10 stainless-steel casks with a capacity of 78 hectoliters each still work fine today, even if the coop bought many more of newer-generation vats since then. These are double casket vats where the wine can be either cooled or warmed up. Still with the technical expertise of the ITV, they selected the best-suited fermentation temperature for their Sauvignon (the Coop makes mostly Sauvignon, as said earlier). They were looking for the aromatic side and freshness with vegetal and exotic-fruits notes. For that, they're having the juice ferment between 14 ° C and 16 ° C. This all contributed at that time to the quality and fame of the Oisly Coop's Sauvignon. 35-ton Bücher pneumatic press They have 4 prsses at the Oisly coop, two big ones like the one on this picture, and two with a smaller capacity. The pressing typically lasts between 3 and 4 hours. The juice flows underground by gravity, then it is pumped in the vats. Compared to these 1970s' years, the type of Sauvignon wine that the people like to drink has changed, Agnès Bardet says, and the temperature setting along with the selected yeasts are central to adapt to the market trend. On the vineyard side, yields have dramatically fallen since these times, she says, the INAO Appellation rules heping giving directions in that regard. But anyway, one of the reasons that made this Oisly coop stand out already then is that it never paid the contributing vignerons on the degré-hecto measure, which basically encouraged growers to maximize their yields (and is widely used in the coops of the south of France). At the Oisly coop, growers were paid for the quality of their harvest. Some vignerons would vinify their wines in their own chai, and the coop enologist would drive there after then and decide if he would, or would not, buy the wine. For the others, the coop would buy the grapes and vinify them in the facility, but the rates weren't set by volumes. The lead Sauvignon of the Oisly coop Agnès Bardet says that the Touraine Appellation isn't very helping to sell the wines or raise the prices, it's still considered a minor region of the Loire. She says that in the 1960s', Sancerre, a now-famous Sauvignon region of the Loire, was then also not well known, but the steady work and mobilisation of its vignerons (in addition, she says, to their terroir qualities) were central to the present international success of Sancerre wines. Better later than never, the Touraine Oisly sub Appellation has been recently created, paving the way for a better awareness on this Sauvignon terroir. Another important thing at this coop is that some terroirs or even some participating estates get their wines vinified and bottled under a separate cuvée, case by case depending of the quality. And these wines are being spotted blind in the international competitions : the Oisly-coop wines get regularly some recognition every year, but recently two of the single-estate Sauvignons of the coop got a gold medal at the Concours Mondial du Sauvignon 2010 in Bordeaux, where Sauvignons fromm all over the world competed. These wines, the Château de Vallagon and the Domaine de la Gitonnière in spite of being labelled under their respective estate names, are both Oisly coop wines. At 5,2 € only at the winery when I visited (the other wine was probably sold out and was not listed), the Vallangon Sauvignon is a also very good value for its price. I'm sipping a few glasses as I finish this story and it's quite an easy and pleasurable drink, a fresh wine, well balanced with some minerality and a light bitterness at the end. The vineyards are on clay-limestone soils (tuff, sometimes very close to the surface) along the Cher river near Montrichard. 12,5 ° in alcohol. They made 500 hectoliters of this wine, the whole of what Vallagon could offer because they have lots of demand for this wine. The owner of this estate is Philippe Potin, who is also the president of the coop. Two of the contributing vignerons are from the nearby Cheverny area, so the coop also makes some Cheverny wines with their grapes. Crossflow Bücher filtering machine This crossflow filtering system, which cost some 130 000 € and works under Nitrogen protection, makes a very good job without the need to buy clay and other disposable filters, the ceramic membranes lasting at least 10 000 hours. The filter system can work by itself without monitoring, under very moderate yields like 15 hectoliters/hour, but they can let it work all night. They waited that the technology improved for this type of machine before making the leap to buy one : in the beginning, the early models raised worryingly the temperature of the wines but in the newer models, this downside was fixed. In the coop system, the member-vigneron is paid monthly, starting for example from april 2011 for the 2010 vintage. With every vintage being paid fully between april and march of the following year, there's no discontinuity in the revenues, every vintage following each other. It's only on the first year when the vigneron joins the coop that he has to be financially able to wait for the following april that the money comes in. 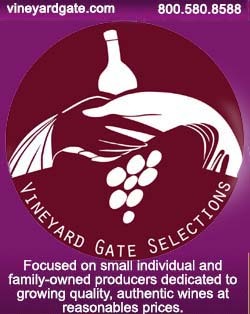 Some of the coop wines are blends made with different wines while some of the wines are single vineyards, and maybe labelled as such under the owner's estate's name. Another interesting thing to note is that since 1995, the coop makes part of its wine from organicly-grown grapes : two of the members/vignerons, Joël Courtault and Alain Courtault farm organicly (conrolled by Ecocert), each managing his own separate vineyard, and their wines are bottled separately in the coop. These wines (three labels) made from organicly-farmed grapes are mostly exported by the way (90 %). Speaking of the rates at which they're paid for their grapes, they get 25% to 30% more than the conventional for a similar quality of harvest. 33-hectoliter Gamay vat Speaking of these two organic vineyards being part of the coop, I asked about the correction of the wines during the vinification, and for example of the use of additives to correct the acidity. Agnès Bardet says that except for the 2003 vintage because it was so atypical, they never add acid to correct the wine acidity. For example in 2010 they had an alcohol/acidity level which was relatively high, with a disappointing summer but a good and warm late season (end of august, beginning of september). There was still a lagging maturity, but with an aromatic potential which she considers extraordinary, and the grapes brought a high level of tartaric acid, which they're not afraid of, part of this acidity going away during the fermentation and during the élevage in the winter. Right now the acidity balance is fine and she hadn't to correct anything. Speaking of other additives, they may use arabic gum on reds at bottling to stabilize the color for certain varieties. Otherwise, they fine the reds with gelatine and the whites with bentonite to take away the proteins. While they don't communicate on this low use of additives with the general public and consumers who could be unsettled by a topic that they don't suspect exist most of the times, the cavistes and proffessional buyers are well aware of their restrained use of additives. She says that additives (intrants in French) cost money and that the coop lowered its expenses on this category in the last 15 years. The maceration vats with underground gutter Agnès Bardet organises the harvest planning for all the estates who bring their grapes at the coop, including for some of the 6 estates who have their wines made here separately and bottled under their own label. She monitors the maturity of all the plots and all the growers know 48 hours in advance which day and at which hour they can begin unload their grapes in the facility. The timing must be respected by the grower so that the whole schedule can hold, and there are penalties for those who don't comply with their time window. From early august, each vigneron must bring regularly grape samples picked in beforehand-determined plots (ilots de maturité or maturity blocks) so that the coop can determine the right timing for each vineyard, because they know already, according to the variety and the type of soil, what typeof wine they'll try to make. For example, the Domaine du Grand Cerf which has vineyards on clay and sand, must not be harvested too late to keep its aromatic properties. Same for the vineyards of the Domaine de la Gitonnière. At the opposite the Domaine Charles Edgar Baron which has vineyards part on clay/limestone, part on sands will have its harvest split, each terroir asking for a different maturity. Central nitrogen unit Actually, Agnès Bardet, who arrived in this coop more than 20 years ago, began working at the coop's lab and also on the vineyard side, and one of her first tasks was to revamp the coop's vineyards cartography, meaning that she took soil samples and other data from all the vineyard plots monitored by the coop. This was in the early 1990s when the vineyard surface was peaking, many vignerons having registered, and it had becomes urgent to list all the different terroirs, and reconsider the varieties growing on each of them if necessary, while noting year after year the potential of each vineyard. At the time there were 1500 individual vineyards listed individually for their characteristics on the Coop's precincts. Now in 2011, there are still about 750 different vineyards on the coop's cartography. She says that this mapping of the vineyards and their soil is very important for the wines. Vats - Crossflow lees filtration unit The crossflow filtering machine above is used only for the lees, which are important with the Sauvignon. The coop makes mostly Sauvignon (80 %), the rest being split between Gamay (the second biggest volume, 15 %, with 1500 hectoliters a year), Cabernet Franc, Pineau d'Aunis, Pinot Noir, Côt and Chardonnay. There used to be more Pineau d'Aunis in the area, she says, but alas much of it has been uprooted in the last 20 years, she says. 3 vignerons of the coop still grow Pineau d'Aunis for a total surface of 5 hectares : Jean-Max Pinard in Choussy, Patrice Abert in Thésée and Pierre Angier in Pouillé (on the other side of the Cher). They make rosé with it, not red, either in direct press or with a light maceration several hours in the press. There used to be some Chenin and Arbois but it almost disappeared. Asked about her own curriculum, Agnès Bardet says that she was trained initially in the plant pathology field, where she learnt about the vine (she's not from a vineyard-growing region) and then she went to Bordeaux for a viticulture/enology degree, after which she worked in Limoux, then here at the Confrérie des Vignerons de Oisy et Thésée. Mobile bottling line There were up to 25 or 28 permanent employees at the coop in the late 90s' and after that they adapted to leaner times that followed, shrinking the workforce to 10 today. In the past for example, they had their own bottling line until 2002 which meant several permanent staff employed just for that sector. Since then, they outsourced the job to an external service company, Loire Conditionnement which brings a mobile unit when needed. Actually, since 2003, the coop joined a large conglomerate, Les Coopératives de Thouarcé, which regroups other wine coopératives and agricultural companies with which they pool their resources and distributing structures. 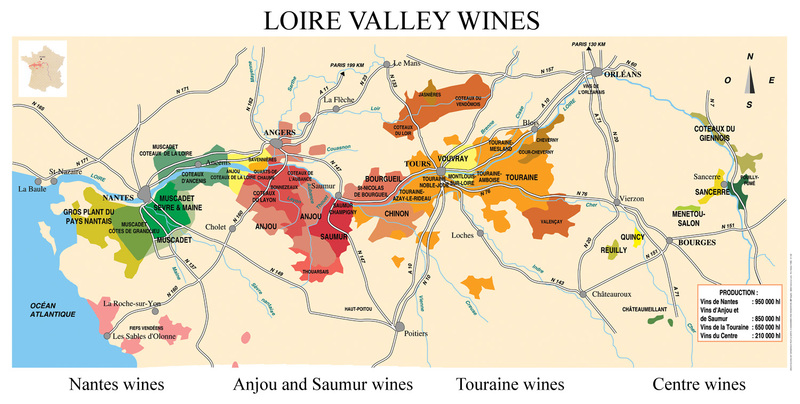 Loire Propriétés is the common distributor through which customers can buy mixed palets from the 4 coops of the group : the Confrérie des Vignerons de Oisly et Thésée (Oisly), the Coopérative Syndicale de Distillation (Thouarcé), the Caves de la Loire (Brissac, Tigné, Beaulieu, Thouarcé) and the SICA des Vins de Rabelais (Chinon). The warehouse, the bibs side on the foreground The warehouse in the Oisly coop also stocks pallets of wines from the 3 other coops part of the holding, so that when customers (cafés, cavistes and supermarkets) want to order a mixed pallet (Muscadet, Chinon, Rosé de Loire and Oisly Sauvignon for example), the delivery trucks don't have to drive to the other coops. __ Sauvignon bib 10 liters : 30 € - 5 liters : 16,5 € (about the same price for rosé, Gamay and red blend bibs). Apart from the Sauvignon Chateau de Vallagon, I tasted the Sauvignon Domaine du Grand Cerf 2009 of which they made 300 hectoliters, a nice fresh Sauvignon. I also tasted the Cheverny red which was rather disappointing. I liked the Pineau d'Aunis although it's a bit ripe and may lack acidity (this is the vintage 2009 I think) and sports 13 ° in alcohol, definitely different from many rosé wines, it has this light bitterness and peppery or spicy notes that can go well alone or with some food. They made 200 hectoliters of this Pineau d'Aunis only. I have several more bottles to taste and I will add the notes later. P.S. I liked very much the Vallée des Rois, Touraine Côt Malbec [as written on the label] 2008. Very nice drinkability and balance, with a pleasant structure and thin tannicity. Definitely worth hoping at the coop too. A great value at 4,3 €. Other vats 35 % of the wines of the Confrérie des Vignerons de Oisly et thésée are exported, to the United States (Grape Expectations), the United Kingdom (PLB), Germany (Hawesko), Sweden (Cash Sweden), Belgium (Delhaize Wine World), Holland (Colruyt), Australia (Coles). Oddly they sell well in Australia (250 to 300 000 bottles/year) Agnès Bardet says, in spite of this country being a big producer of Sauvignon. They come here, taste the vats and prepare sample blends that the coop will bottle for them. Makes my day when you post something new. You do a great job. Thank you.